We are so close now to the release of Batman v Superman: Dawn of Justice which opens in theaters next week. 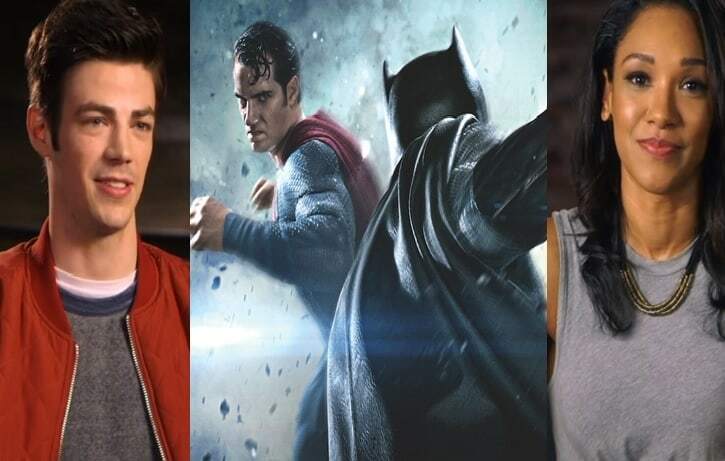 Recently, the cast of CW’s The Flash got together for a interview about who they think would win in a fight between the Man of Steel and the Dark Knight. Featured in the video are Grant Gustin (Barry Allen/The Flash), Candice Patton (Iris West), Carlos Valdes (Cisco Ramon), Danielle Panabaker (Caitlin Snow), Keyinan Lonsdale (Wally West) and Jesse L. Martin (Detective Joe West). Find out who they think would win by checking out the video below. “Fearing the actions of a god-like Super Hero left unchecked, Gotham City’s own formidable, forceful vigilante takes on Metropolis’s most revered, modern-day savior, while the world wrestles with what sort of hero it really needs. And with Batman and Superman at war with one another, a new threat quickly arises, putting mankind in greater danger than it’s ever known before. The Flash, which returns with all new episodes on March 22, airs on Tuesday nights, 8/7c on The CW. Batman v Superman: Dawn of Justice comes out in theaters on March 25.